Terjon, the second-in-command, is an adventurer at heart. He prefers that Y'dey manage the temple’s affairs so that he can go on expeditions. About one-quarter of the time, he is off on a quest for an artifact, some treasure to fill the Church's coffers, or whatever goal he can achieve in service of his god. He’s eager to join up with good-aligned adventurers for a short-term mission but won’t join a group that is less battle-capable than him. He questions any potential companions to make sure that they won't be dead weight on his missions. 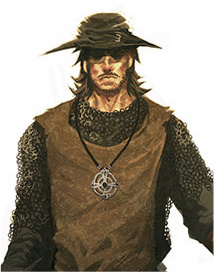 Terjon is gruff, with dark brown hair and eyes. Most townsfolk do not care for him, preferring the softer touch of Y’dey or Calmer. Zeke appreciates Terjon's no-nonsense attitude… or would if the two were ever in town at the same time.